Here's how to use library search to get more specific results. Basic library searches involve typing in a string of text that returns a wide variety of results. Advanced searches let you use keywords to refine your search. When you type a search term in Library search, Populi looks through three resource fields for your term: Title, Author/Creator, and Subject. Search results will then include all matches from all fields. That's what happens when you type text. You can also search for particular barcodes and call numbers; just type in the number. Keep in mind that other resources will show up in your results. If you search for call number 1984 YL04.502, you'll get that call number as well as George Orwell's 1984. See Keywords for information on how to limit your barcode and call number searches. 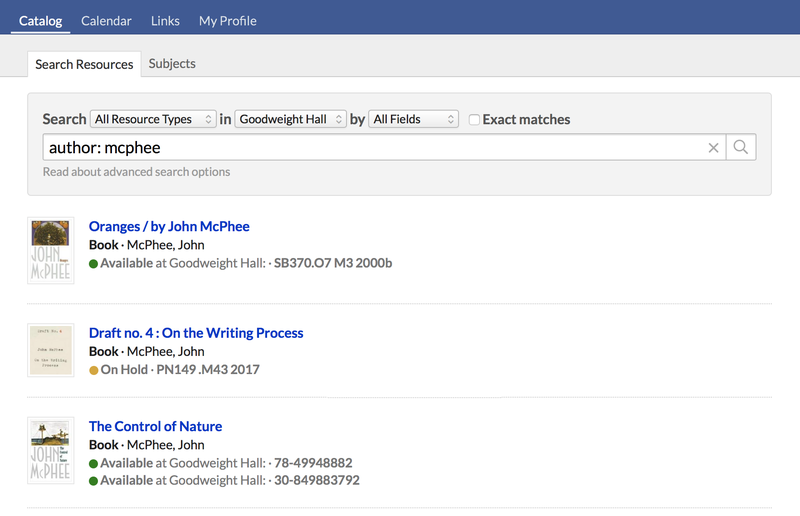 Populi Library uses "fuzzy matching" for basic searches as outlined above. In addition to searching through the different resource fields, it also checks for words that look and sound similar to your search term. Advanced search operators make your searches more specific either by focusing your search or excluding results from your search. You can use these operators in combination with one another. Keywords focus your search to specific resource fields. They also let you search for particular phrases (groups of words). barcode: or call number: If using the barcode and call number keywords, your search term must match the entire barcode you are searching for. OR lets you search for more than one discrete term at a time; just insert it between one term and the next (you can use it multiple times). subject: poetry OR criticism OR history... will return all subject fields that match poetry, criticism, or history. poetry OR yeats OR weather... will return all resources with matches in any field for poetry, yeats, or weather. - The basic dash/minus symbol lets you exclude terms from your search; just insert it right before the term you wish to skip. author: shakespeer title: -midsummer... will return Shakespeare's works (thanks to fuzzy matching) except for A Midsummer Night's Dream. EXACT Begin your search string with EXACT (must be in all caps) to turn off fuzzy matching. EXACT title: great author: fitzgerald... will return F. Scott Fitzgerald's The Great Gatsby. "___" Surround a multi-word search term with quotes to turn it into a search string; this will search for complete phrases. title: "world war ii"... will return titles that match the string world war ii; fuzzy matching still applies, so it will also find titles containing world war i and werld wor too. How do I get the list of required books for the academic term?